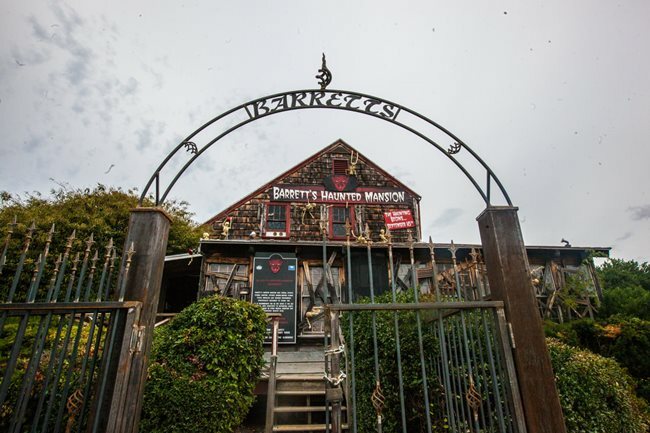 Barrett’s Haunted Mansion is one of only a very few Halloween attractions that I must see every year, and last year I called it #1 in Massachusetts and the most theatrical haunted house that I’d ever seen. It’s based in Abington, Massachusetts, just a half-hour drive from Boston on the late weekend evening that you are likely to travel there. Making storylines for Halloween is the strength of Barrett’s Haunted Mansion, and they change it every year. The scenery, props, costuming, and makeup are all at theatre level, with seemingly a high budget production value. Even when you’re in line to buy tickets, you’ll pass through a spooky haunted tunnel. Although you’ll certainly be startled, their attractions are far more than jump scares. Instead their actors have a real, though brief, story to tell, in the 15-30 seconds you spend in each room. They feature two attractions this year: The Sanctuary and Barrett’s Haunted Mansion. The Sanctuary is a welcome replacement for the maze of The Cell, this year with a pseudo-religious theme. You walk in through a cemetery, encounter a haunted church, a cult ceremony with a sacrificial body mounted on a spit, and go “underground” through the trenches of a graveyard, looking up into the open night sky. The environment is perfectly engaging to make you suspend disbelief. Each walkway has interesting siding, not just painted plywood as you’ll find at other attractions. The dirt walls of the underground trench must be some kind of sprayed foam, seamlessly swallowing you up, even with caskets just visible in the dirt around you that you pass. There’s nothing about The Sanctuary that seems storebought or borrowed cheesily from a movie or TV show. Instead the characters set up original scenes, each with real dialogue to act out to visitors. Several told us, “Salvation is this way”, while directing us to the next room. The experience is stunning, though short, perhaps 5-7 minutes’ long. They separate visitors into small, timed entry groups so that the surprises don’t get spoiled by a group too close in front of you. Then get into line for the main attraction, the actual Barrett’s Haunted Mansion. Outdoors they have a large covered area in case it is raining a little, and costumed actors come around scaring and entertaining guests while you wait in line, including a psychotic clown and an undead Yankee Fisherman with yellow raincoat who didn’t survive The Perfect Storm. This year it begins with a jail theme. You get taken into a cell and locked in with mad prisoner! Somehow you are forced to escape and journey through what seems like an insane asylum, where an inmate taunts you with multiple exits and again you’re forced to escape. The jail theme quickly gives way to a variety of different themes. You’ll see a severed body room, space aliens dressed as farmers in a corn field, and a room with an enraged blue mountain hick. You’ll find many “blind” effects, where you can’t see and have to get through by feeling, because there was either fabric in your eyes or it was too dark to see. Touching one such wall will shock you, but it’s not painful. There’s great attention to detail in the house, including a stairwell whose lights are on for safety, but contains a corpse and bloody footprints. You’ll cross a bridge of hanging wooden planks, and best of all, a cave with a water fountain. Elsewhere, lasers spell out haunted words. The building is densely packed with actors, with great costuming and set design. Actors had great energy even though it was early in the season. 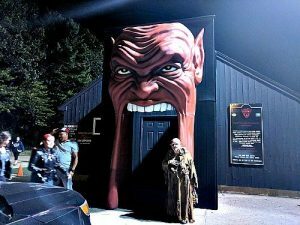 Barrett’s Haunted Mansion shares a parking lot with The Abington Ale House, which is owned by the same family, and you can get “Bite and Fright” deal for $40 there. There is plenty of free parking, and you can buy “R.I.P.” tickets (instead of VIP tickets, get it?) to get you straight to the front of the line. Outside, they have an ATM machine, portable toilets, and a gift shop that sells sweatshirts, stickers, shot glasses, ponchos, beanies, hats, key chains, magnets, pins, wrist bands, and more. You’ll find a snack shack featuring fried dough as well. Barrett’s Haunted Mansion has events including Darkness Unleashed on October 23, when they turn off all the lights. Saturday afternoons they have a not-so-scary “Lights On Tour” for smaller kids, including going backstage. Or attend “Devil’s Night” on October 30, when the monsters are allowed to lightly touch you in line and in the haunts. Barrett’s Haunted Mansion and The Sanctuary only add up to perhaps 20 minutes of walking, so it’s hard for them to compete with outdoor woods walks, hay rides, or attractions that have a number of destinations. Somehow they do it anyway. Last year was a mind-blowing sensation I had never seen before. This year, a strong 5 stars again for Barrett’s Haunted Mansion.